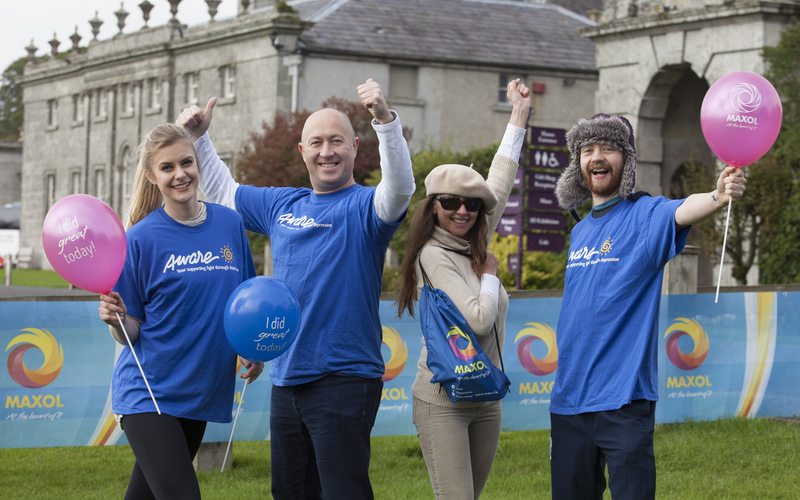 Pictured at the recent launch of Maxol and AWARE community Mood Walk at Russborough House were Anne Jankauskaite, Gerry O’Brien AWARE, Rachel Mc Mullan Maxol The Crossings Naas, and Aaron Mills. Leading forecourt convenience retailer, Maxol are thrilled to announce that they have raised almost €1,500.00 for the company’s charity partner AWARE, thanks to the teams at Maxol The Crossings in Naas, Maxol N7 Services and Maxol Ringsend. The first of the Mood Walks took place in Dublin, starting at Maxol Ringsend and saw walkers take a route from the Maxol Ringsend station to Martello Tower in Sandymount and back, a distance of approx. 5 kilometres. The second community Mood Walk took place at the same time at Russborough house, Co Wicklow, organised by the teams at the Crossings and Maxol N7 Services, where local people gathered to support the worthwhile event by participating in a 5 kilometers pre-routed walk around the beautiful grounds overlooking Blessington Lakes. The aim of the new community Mood Walks is to help raise vital funds for Maxol’s charity partner AWARE while encouraging members of the community to come together for a good cause. AWARE was founded in 1985 by Dr. Patrick McKeon and a dedicated team of volunteers. AWARE aims to promote positive mental health in communities nationwide. The Maxol Group was established in 1920 by William McMullan. The 4th generation of the family are Company Directors. Maxol makes a significant contribution to the economy on both sides of the border and markets a comprehensive range of oil and petroleum products to the Irish Market, through their Retail Fuel Card and Lubricants divisions. The Maxol Group had an annual turnover of €640m in 2015. The company employs directly and indirectly more than 1,000 people across the island of Ireland. Maxol has been investing and expanding in recent years and currently has a network of 234 service stations, of which 111 are company owned. The new food brand Moreish – Fresh Food at Maxol was launched in 2014 and is currently in 31 Maxol service stations and growing. It won ‘Best Oil Company Initiative’ at Ireland’s Forecourt & Convenience Awards 2015. Maxol was voted the most reputable oil company in Ireland for four consecutive years between 2012 to 2015 by Corporate Reputations independent survey.